to accompany the Grandstand show at the 1946 Iowa State Fair. 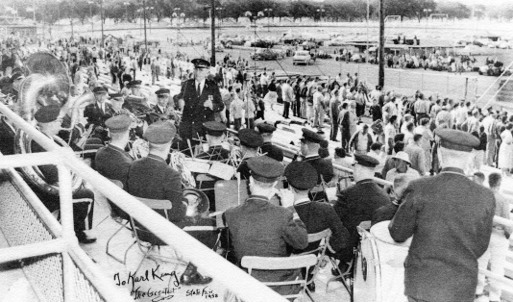 In addition to conducting the Fort Dodge Municipal Band, Mr. King became director of the Iowa State Fair Band in 1921 and for nearly four decades the distinguished bandmaster was a familiar figure at the fairgrounds in Des Moines. A whole generation of fairgoers felt regretful when he relinquished that post at the end of the 1959 season. He also conducted the Spencer Fair band for 38 years. 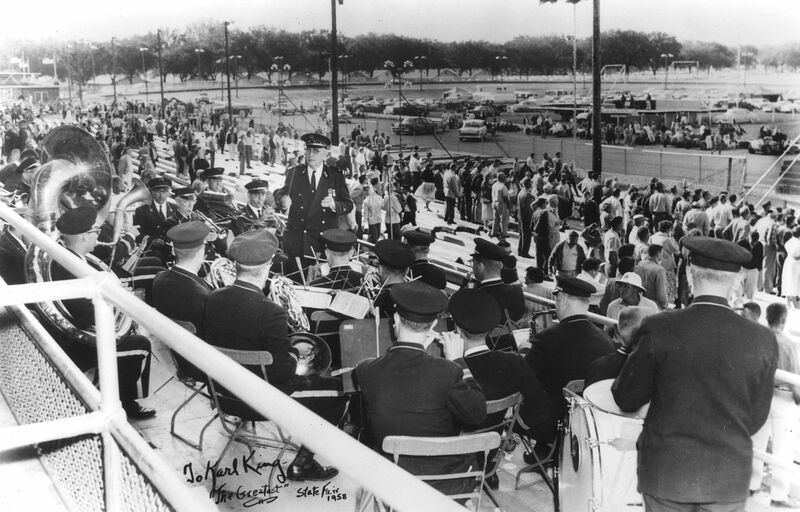 The King Band is seen playing in the Grandstand for a car thrill show at the Iowa State Fair. This photo was taken on July 20, 1958 by Marvin Huddleson, band director from Onawa, who happened to be at the fair that day. FORT DODGE, IA, -- For the first time in 35 years, Karl L. King will NOT present his band at the Iowa State Fair this year. Like the circus "big top," of which he was a veteran, he feels that his era has ended. The thousands who had come to know the famed Fort Dodge band leader-composer in appearances in front of the grandstand at the fair will miss him. But King says the end was inevitable, expected the last few years just like the demise of the big top. Several weeks ago, King presented an "all-circus" band program , a farewell salute to the big top, in the Oleson Park band shell here. The program was practically "all-King" as well, presenting many numbers the Fort Dodge composer had written. For instance, "In Old Portugal" was played. 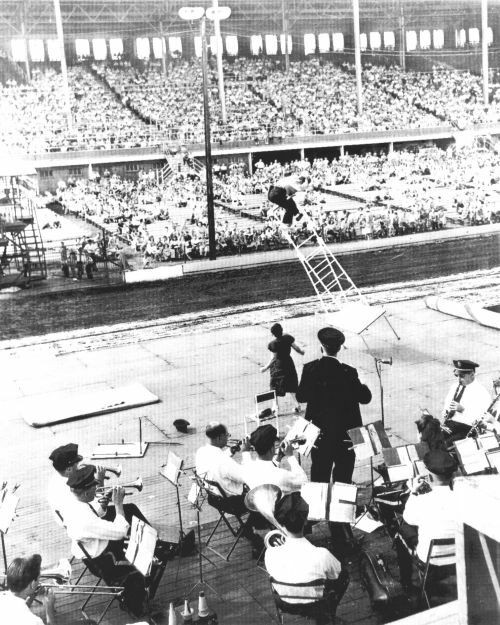 It was written by King for Lillian Leitzel, famous aerialist who defied death in "The Big Swing" act high in the tent. It was being played during her performance Friday the 13th in February, 1931 -- when she fell to death in Copenhagen, Denmark. A brass swivel on her rope had broken. The King band -- formerly the Fort Dodge municipal band, which he has directed 35 years -- also played "The Big Cage," a fast finish number written by King for the climax of Clyde Beatty's animal act. With Three circus Bands King, 65, who started playing baritone horn in circus bands in 1910, traveled the tanbark trail with Yankee Robinson, Sells Floto and Barnum and Bailey bands before becoming director of the Sells Floto musicians in 1914. After three years, the Iowan became director of the Barnum and Bailey band during the seasons of 1917 and 1918. "It was in 1919 that Ringling Brothers combined with Barnum and Bailey. I'd always had a desire to settle down someplace and write music -- but the circus life really gets in your blood. I decided the time had come to quit: I did, and came here," he said. "Merle Evans, who had been with the 101 Ranch Show, became (band) director of the combined circuses -- and stayed on the job until last year, when John Ringling North introduced an orchestra-type band into the circus. "I enjoyed every bit of the circus life. When I left it, I felt a bit lost for a few years," said King. King has operated the Karl L. King Music Co. here about 35 years. He publishes band music, distributing it over the nation. Next door to his company, in an arcade, is the Ruth King Music Shop -- operated by Mrs. King. It sells musical instruments. Wrote Marches For Colleges Up to last year, King has written pieces for many colleges, including some of the Big Ten's marching songs. Many of the circus pieces he wrote have been used through the years -- "Barnum and Bailey's Favorite," "The Golden Dragon Overture," "Broadway One Step," which was a clown parade number, and "Enchanted Nights Waltz," written for a high trapeze act. King wrote show pieces before he got into the Barnum and Bailey band. In his "all-circus" program, King presented a tune called "Wyoming Days," written for a cowboy riding act that was part of the Buffalo Bill show, then combined with the Sells Floto circus. King wrote that one 42 years ago. Now the Ringling Brothers and Barnum & Bailey circus has folded its tents in midseason and gone home. The Clyde Beatty circus closed after a few spring weeks. Probably memories of them will be stimulated for years to come by the stirring King music that accompanied them. Other bands will appear at the Iowa State Fair. But the traditional appearance of Karl King will be missed by many fairgoers. Karl King and his band were asked to return to the Iowa State Fair several more years after this article appeared in the Des Moines Tribune. The band's summer fair circuit, however, had been trimmed to include only the Clay County Fair in Spencer and the Iowa State Fair.